Curating the perfect jewelry stack can be a challenging endeavor as far as accessorizing goes. Not only do you need to find pieces that play well off each other without competing, you want to make sure it all looks kind of effortless — like you just threw on some of your favorite jewels and they just happen to all work together in harmony. Yes, the art of layering jewelry is one that can take some time to master. If time isn’t something you’ve got much of, though (who does? ), allow us to present the lazy girl’s go-to: the pre-layered pendant necklace. 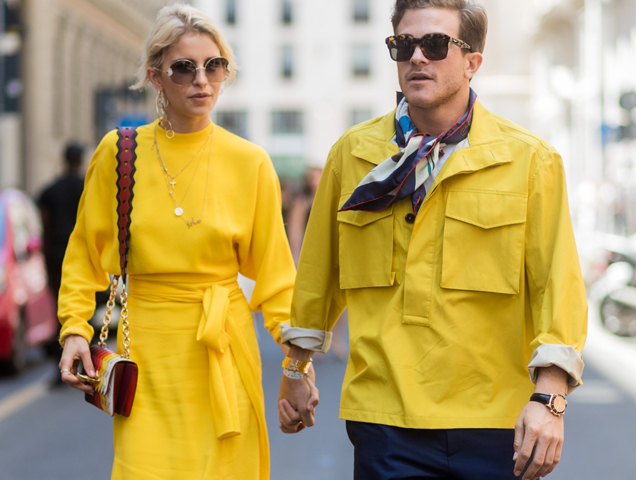 If you’ve got your eye on street style on the regular (raises hand), you’ll have already noticed that photog favorites like Caroline Daur and Tine Andrea all make a habit of piling on their personal pendants. Pairing them with the current, more delicate incarnations of the choker necklace, these dainty layers make the perfect partners for everything from deconstructed button-downs to jumpsuits to sweatshirts. By adding eclectic jewelry groupings to their looks, these It girls are giving their outfits an aura of “I just threw this on” — when you know they did anything but. Even celebs are in on the action. Emily Ratajkowski showed her curated collection off on Instagram, complete with hoops and a headband, proving more is absolutely more sometimes. Alessandra Ambrosio plugged her Jacquie Aiche collab with a perfectly put-together stack of pendants and playmates (say that three times fast). It’s the stuff of personal jewelry dreams, enough to make a girl weak in the knees. So, if you aren’t blessed with an unlimited accessories budget? Fear not. An all-in-one necklace stack offers you everything required to get that cool vibe like that while still staying totally wallet-friendly. If you’re ready to get this pendant party started, take a scroll through our slideshow of pre-layered pendant necklaces. We guarantee you’ll pick up a few friends you’ll want to add to cart ASAP.